This selection of 12-volt solar systems can be used with a wide range of applications. In addition to 12-volt solar panels for motor homes, cabins and campsites, you'll also find auto solar panels for use with your vehicle. Whether it's a golf cart, a jet skit a motorcycle or an engine starter, you'll be able to use solar power to get where you need to go efficiently. A wide variety of panel sizes and arrays are available to meet your space and power needs. Plus, you'll love that the products in this collection all come from trusted brand names such as Grape Solar, Renogy, Nature Power, UPG and, of course, Earthtech Products. 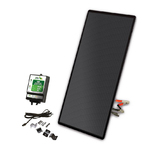 Find the perfect 12-volt solar kit for your needs by browsing our full collection today. At Earthtech Products, we make it easy to use solar power to your advantage. Solar panels aren't just for expensive rooftop setups anymore; you can also use them for basic, everyday needs thanks to these handy products. We're experts in all things solar, so get in touch with our professional and friendly staff if you have any questions. And don't forget to join our rewards program to get faster checkout and earn points towards future purchases.